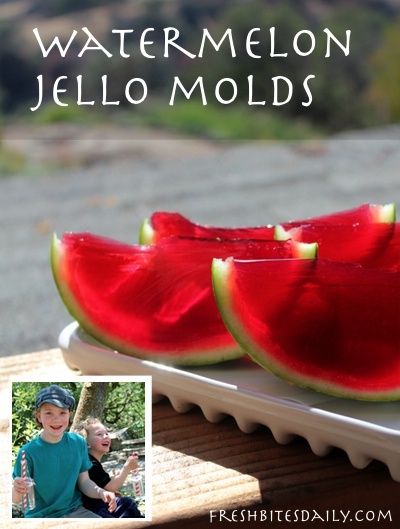 Watermelon “jello” mold: So much summertime fun! Here’s a project that I really thought would fit the “Pinterest fail” category — you know, where you see the pictures and then try it at home and realized you’ve wasted forty dollars in ingredients and two hours of work. This project was so successful that we laughed and giggled. Then we invited over a few people to offer them some and they laughed and giggled. Then we made the video below and laughed and giggled more. You may wonder why you should even bother with this project. Really, it’s a gelatin dessert that could be made more easily in parfait dishes. Indeed, it can. Gelatin in little glass dishes have never caused anyone in this house to giggle and so whether you try this project may depend on if you need a giggle or two in your household. I recommend a smaller watermelon. There is a watermelon variety that is round and small and has just over a quart of volume inside. I would recommend that for your project. The watermelon will hold together better once you slice it — basically, it will be a bit more structurally sound. It is also easier to fit in your refrigerator. If you use a bigger watermelon that is more oblong, I would slice it at the equator instead of down the poles. Your final pieces will be more structurally sound and your two halves will fit in the refrigerator better. Don’t plan to keep this in your refrigerator for more than a couple of days. While gelatin desserts last quite a while in the refrigerator, the watermelon rind begins to degrade as soon as you slice it. Don’t try to hold the rind itself before finishing the project. You might be tempted to scoop out the watermelon one day and then make the gelatin dessert the next. While you could do that, your rind just won’t be as fresh. I would plan to scoop out the fruit, make a drink or other treat with it, and have your gelatin project ready for that rind. Watch the video for step-by-step instructions and grab the recipe below. Place the hibiscus and honey in a sauce pan. Boil the water and pour over the hibiscus and honey mixture. Let sit covered for a few hours or overnight. Strain off the hibiscus flowers and add the lemon juice. Prepare your watermelon as in the video (scooping out the actual fruit). Reheat 3 cups of the liquid mixture to boiling and retain one cup to add gelatin. Sprinkle gelatin over the colder one cup portion of your liquid. Stir well and allow it to sit for one minute. Pour over the boiling 3 cups of your liquid. Stir well. Allow the liquid to sit for about 10 minutes before pouring it into the watermelon rind. Pour it into the watermelon rind and refrigerator for about 5 hours.